Acetanilide or N-phenylacetamide is an aromatic compound having phenyl ring attached to an acetamido group (–NHCOCH3). In 1886, acetanilide was introduced as an analgesic and antipyretic drug into medical practice by A. Cahn and P. Hepp. Since then, many acetanilide derivatives have been found to have antimicrobial, analgesic, anti-inflammatory, antipyretic, antioxidant, anticonvulsant, anti- cancer, antihyperglycaemic and antimalarial activities. Acetanilide also plays an important role in the synthesis of a number of chemicals as intermediates and precursors. 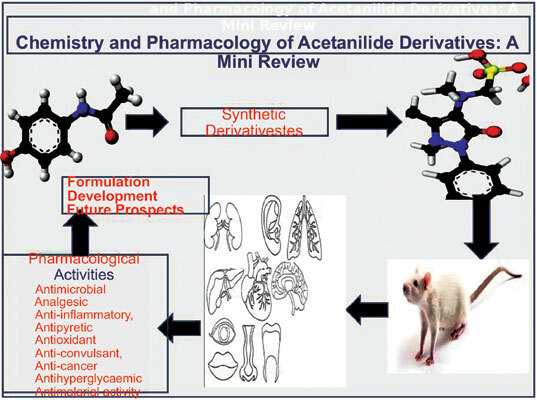 The chief objective of the present article is to highlight the chemistry and pharmacological aspects of various derivatives of acetanilide and their pharmacological activities to assist the future discovery of more efficacious derivatives with less toxicity. Acetanilide, analgesic, antipyretic, anticonvulsant, anticancer, antimalarial.